Lundi on déménage ! For some reason, it sounds more specific in French than the English “We’re moving on Monday !” I guess it’s because “move” can be used to mean so many different things but déménager always means moving house (or office or whatever). A ménage, which comes old French mesnage, a derivative of the Latin mansio (house), is a married couple or a household, so déménager literally means “breaking up the household”. And that is exactly what is happening at the moment as I sort out and pack up our goods and chattels accumulated over the last 9 years (and more). We’re having déménageurs do the actual moving with a camion de déménagement. Déménageur refers to both the removalist company and the individual person doing the moving. I had 5 devis (quotes) done. The estimated volume ranged from 52 cubic meters to 67 cubic meters, which is astonishing. 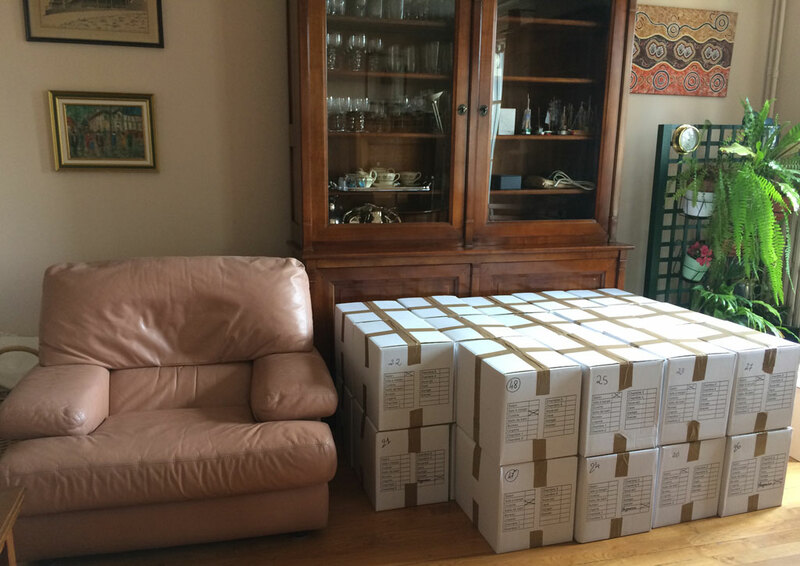 And the prices ranged from 2,500 euro to 4,700 euro to move our belongings to Blois, 200 kilometers away. I was so suspicious of the lowest quote that I rang them to find out why. They had made a mistake and quoted for Paris! They increased the quote to 3,000 euro which was still belong the next price of 3,600 euro so we chose Ultimate Déménagement. We’ll see how competent they are! Déménageur has given the expression il a une carrure de déménageur – he’s built like a tank. 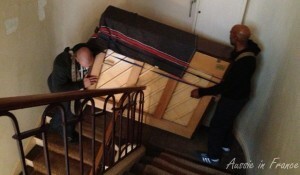 But the champion of all was the single porteur who originally carried our piano up four flights of stairs on his back. It took two déménageurs to take it down again. They had heard of a porteur but never seen one in action. Another expression that I like is déménager à la cloche de bois: to sneak off in the middle of the night. Though why there is a wooden bell involved, I don’t know! Also, ça déménage is slang for “it’s brill/awesome”. The verb ménager, however, means something totally different. The idea is to make sure a person is not offended. Il faut vraiment la ménager, elle est très sensible – You have to treat her gently – she’s very sensitive. Il faut qu’on ménage les deux parties – We have to keep both parties happy. Si vous ne la ménagez pas, elle va beaucoup souffrir – If you don’t treat her tactfully, she will be very hurt. Another great expression is ménager la chèvre et le chou (the goat and the cabbage) = to sit on the fence. When applied to an object, ménager means to treat something with care or sparingly. The most widespread use is ménager ses forces or efforts = to save or conserve one’s strength. Un bon déménageur sait ménager ses forces pour mener à bien le déménagement. = A good mover knows how to save his strength so the move will go well. This entry was posted in French language, Uncategorized and tagged déménager in English, déménageur in English, Friday's French, ménager in English.. Bookmark the permalink. The goat and the cabbage…. that’s one expression that’s not made it into the English language. You could start a trend! Exciting time for you both. Trust all goes smoothly. When I had my baby grand piano moved up two flights, they took off the legs! maybe it was easier than an upright piano by the looks of things! Well, a grand piano is much much bigger! Oh, thank you, Flocon, I hoped someone would know the answer!